Put down your chopsticks and take a big gulp of sake because the next Circus Posterus x Tomenosuke sofubi is about to light up your sinuses! This time around lil Miss Ginger has invited her cousin The Stinky Ginger Golden Spicy to the party, and she is just as stinky and even more spicy! All that glitter is gold in her book! Those attending Circus Posterus’ “Traveling Circus” at Rotofugi will get the first shot at Chris Ryniak’s The Stinky Ginger Golden Spicy that weekend with the rest of us seeing the release at www.circusposterus.com and http://www.tomenosuke.com/ shortly after. The Stinky Ginger Golden Spicy is an edition of 60 for $89. 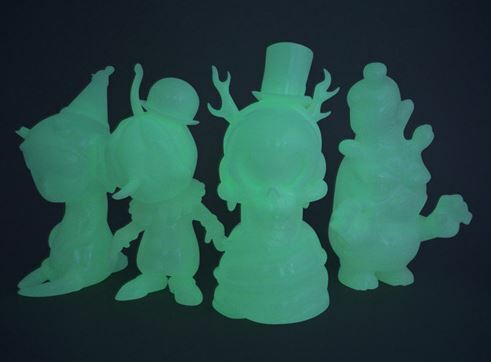 If you missed this 4-pack of glow in the dark awesome at DCON 2013, have no fear because the rest of the allotment go on sale this Friday. Releasing this Friday, January 31 at noon PST is the GID sofubi set from Circus Posterus x Tomenosuke! The set includes: Calliope Jackalope, Stingy Jack, Stinky Ginger, and the first ever colorway of Heathen Snake Skelve. You will be able to find these four in the CP Store here. The Tomenosuke + CP Chibi Series is Coming! The clues have been out there for quite some time, but we can finally start to show off what’s in store for 2014…the Tomenosuke + CP Chibi Series! Chibi is a popular Japanese character style, drawing fans of the small and cute. Imagine smaller and even cuter little versions of the toys we all know and love, and know that the Tomenosuke + CP series is taking this idea full throttle. 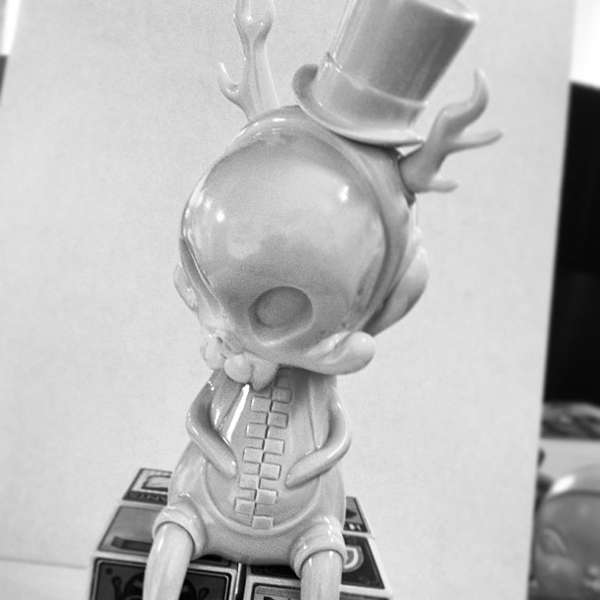 Here is the test sculpt of Brandt Peters‘ Skelve for the series, sculpted by the amazing Yohei Kaneko, in all his squat, bow tied glory. We don’t have the exact production details yet, but we do know, that they are small / two-part figures and part of a line that will include Circus Posterus favourites, and guest artists. Also, for even more fun – their heads will all be swappable. The first series in the line- up will feature Kathie Olivas, Chris Ryniak, Amanda Louise Spayd, and Brandt Peters. Check out more of the design below. 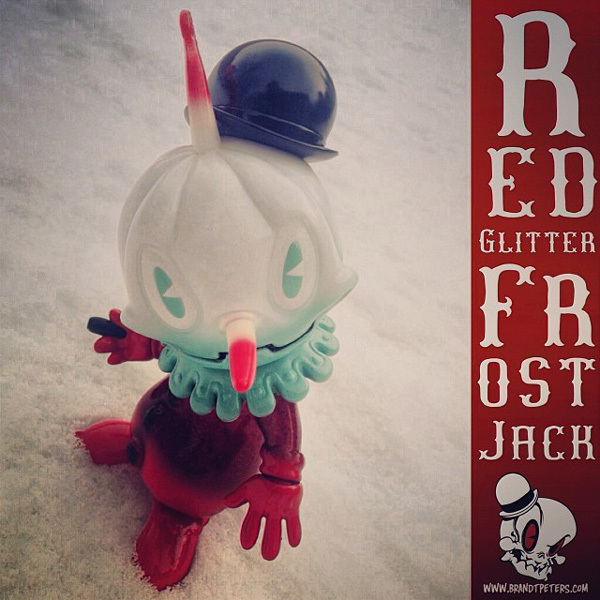 Looks like we know what the next Tomenosuke x Circus Posterus Sofubi is, the Red Glitter Frost Jack! Look at the sparkly goodness in that red body! Ready to fire this winter with details coming soon!!! 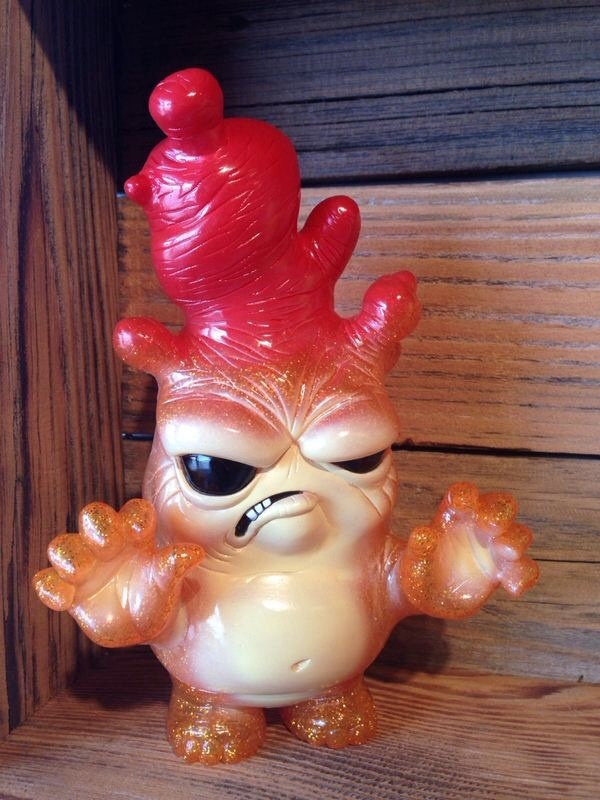 For the first time ever, the glow in the dark sofubi we saw at Monsters and Misfits III is coming to the US! This luminescent group of misfits are charged and ready for their debut at Designer Con! 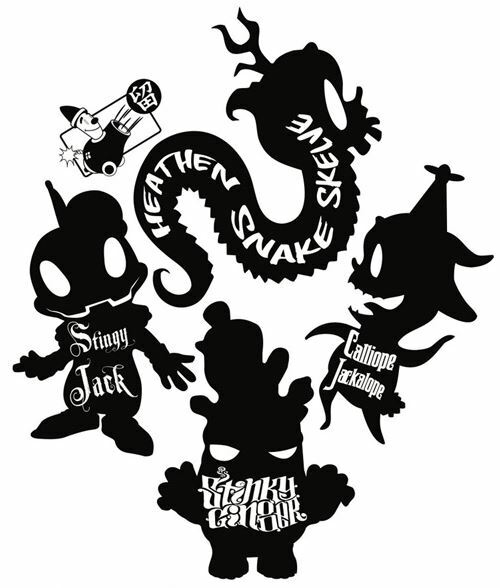 Here, you will see Calliope Jackalope by Kathie Olivas, Stinky Ginger by Chris Ryniak, Stingy Jack by Brandt Peters, and the brand new Heathen Snake Skelve. This limited group will be available in a bundle pack including all 4, as well as a very small amount sold individually. After the success of all the other Tomenosuke + Circus Posterus sofubi, these will not last long. You can find them at the Circus Posterus booth #400 at DesignerCon this weekend! We all know Brandt Peters’ interpretation of Stingy Jack, but have you ever wondered where this amazing character came from? Even though Brandt is a genius, he didn’t come up with the tale of the ill-fated Stingy Jack all his own because the history of this man dates back to the early days of Halloween itself. Being Halloween is a mere two weeks away, we thought we would rediscover the history of Stingy Jack, and sit down with Brandt Peters on why this character is dear to him. 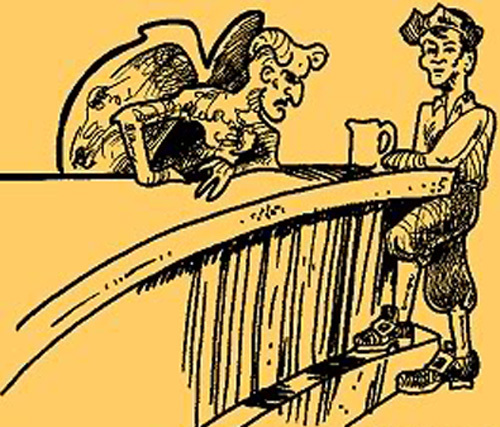 As the story goes, several centuries ago amongst the myriad of towns and villages in Ireland, there lived a drunkard known as “Stingy Jack”. Jack was known throughout the land as a deceiver, manipulator and otherwise dreg of society. On a fateful night, the devil overheard the tale of Jack’s evil deeds and silver tongue. Unconvinced (and envious) of the rumors, the devil went to find out for himself whether or not Jack lived up to his vile reputation. Stingy Jack invited the Devil to have a drink with him. True to his name, Stingy Jack didn’t want to pay for his drink, so he convinced the Devil to turn himself into a coin that Jack could use to buy their drinks. Once the Devil did so, Jack decided to keep the money and put it into his pocket next to a silver cross, which prevented the Devil from changing back into his original form. Jack eventually freed the Devil, under the condition that he would not bother Jack for one year and that, should Jack die, he would not claim his soul. The next year, Jack again tricked the Devil into climbing into a tree to pick a piece of fruit. While he was up in the tree, Jack carved a sign of the cross into the tree’s bark so that the Devil could not come down until the Devil promised Jack not to bother him for ten more years. Now that we know the history of Stingy Jack, we wanted to see what drew in Brandt to bring this story to life in his art. Brandt was kind enough to take time out of his very busy day so we could pick his brain on this amazing character. CP: What drew you in to the lore of Stingy Jack? Brandt Peters: I have always been a story teller… I just happen to use toys, paintings and media of all types to tell my tales. I have a fascination with myth and folk tales from around the globe. An ongoing idea that I continually explore is to re-tell or even concoct “new” American myth. Stingy Jack is one of the folk tales that I am in the process of retelling and re-developing internally at Circus Posterus and it fit perfectly into my world of antique heroes and old-world scoundrels. I am not sure how much you know of the tale… The Devil and Stingy Jack are locked in a perpetual battle of who is the most evil. The very idea of their relationship was so fantastic and absurd. The humor alone in this notion seems historic to me. As a huge fan of the tale, I felt compelled to fill in the blanks, the ongoing adventure of the two most envious and vile characters in the universe trying to outwit each other infinitely. 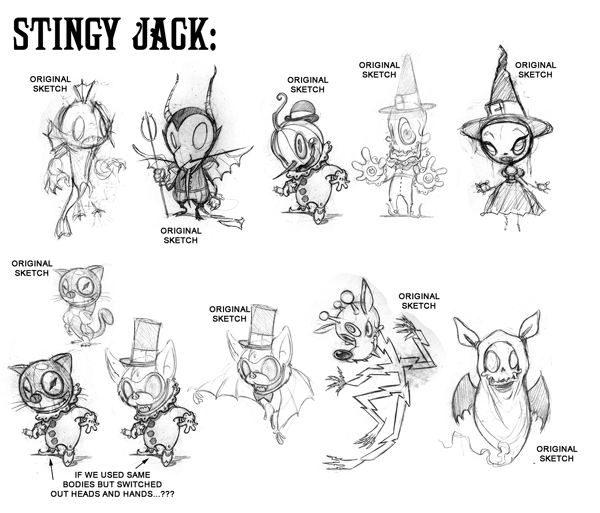 I love the simple basis behind the lore of Stingy Jack and his curse, and personally felt it was always incomplete. I wanted more! Click MORE for the rest of our interview with Brandt Peters on his love of Stingy Jack. Get Ready for Halloween Again! Have you started decorating for Halloween yet? Well, if you are in the planning stages and need some items to adorn your abode, we have got you more than covered. Since we love Halloween and this time of year, the Circus Posterus store is packed full of toys and art perfect to creep out and inspire your party guests. Actually, we think it will show them what great taste you have! Above we have Kathie Olivas’ Calliope “wicked” version. Being mischievous in fall colors this 9″ tall vixen is a low edition of only 80. 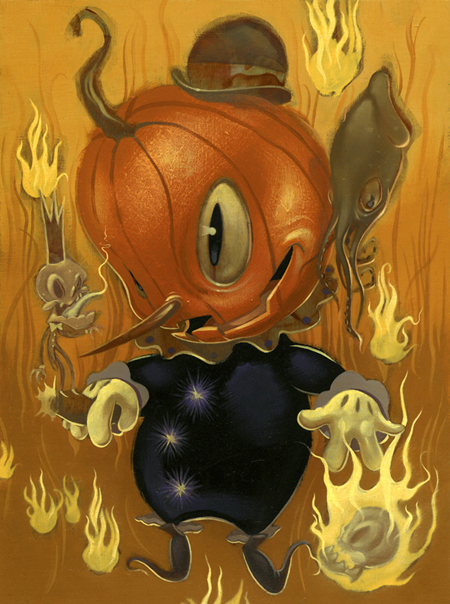 Below are those pumpkin headed creations from Brandt Peters‘ “Toxic Marshmallow” and “Old Timey” Stingy Jacks. With respective editions of 100 and 120, that will be gone soon since very few are left. 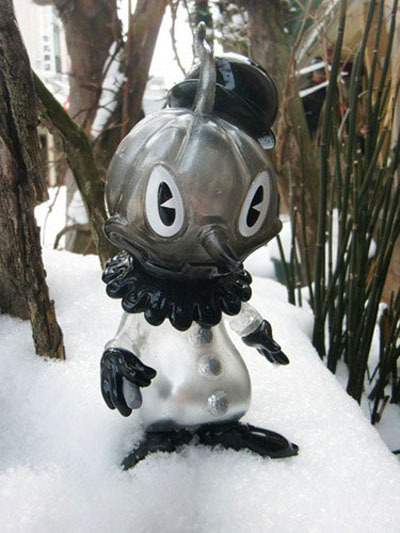 You can find all these Halloween sofubi right here along with much more. 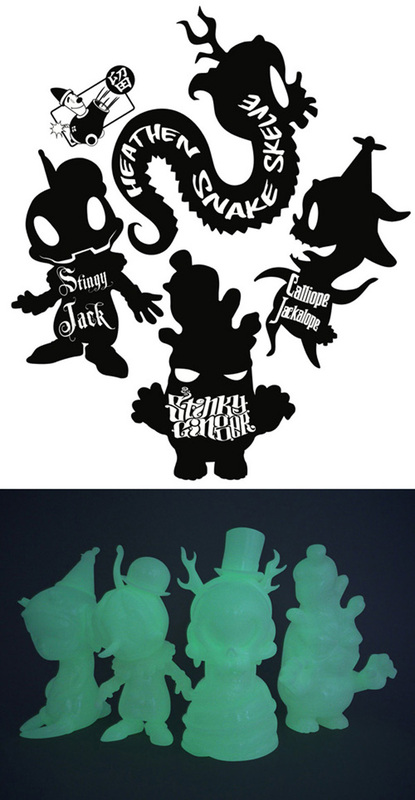 Sofubi Glow in the Dark 4 Pack! The snake is finally out of the bag, because we saw it at Monsters & Misfits III. 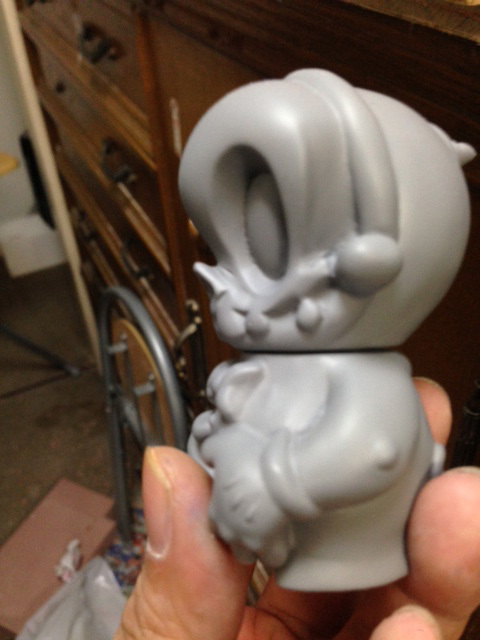 Finally in glow in the dark form are Tomenosuke x Circus Posterus sofubi! This shining four pack consists of Brandt Peters’ Stingy Jack, Kathie Olivas’ Calliope Jackalope, Chris Ryniak’s Stinky Ginger, and the debut of the Heathen Snake Skelve! Limited to only 80 sets, 40 are assigned to MMIII got 40 and the other 40 will be coming state side. Fear not true believers, how and where these will be sold in North America will be divulged soon, so keep watching. They turned out amazing, and that Heathen Snake Skelve is a splendid new addition to the sofubi line! It looks like all the suspicions with that header card teaser are correct! 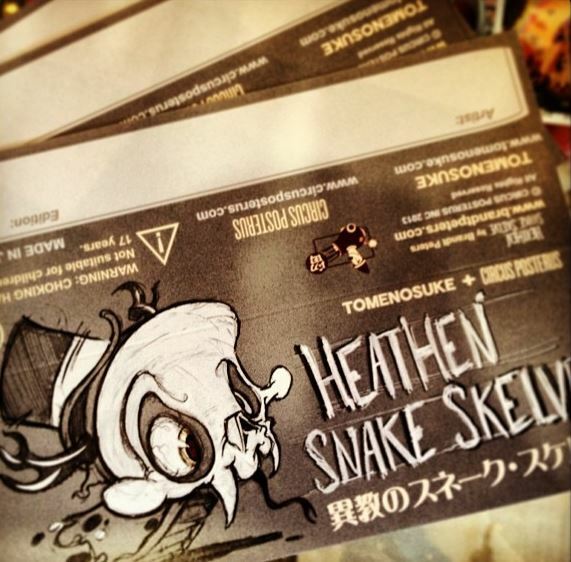 A Heathen Snake Skelve sofubi is coming! 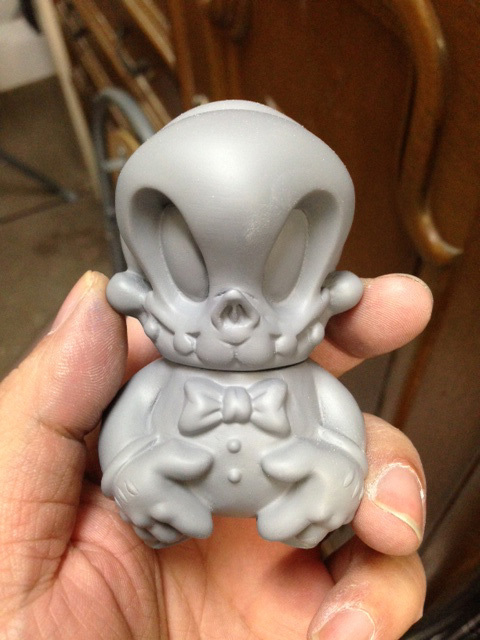 All the signs are pointing to VERY SOON because Brandt and Kathie are having a blast monster mashing all the other Circus Posterus x Tomenosuki sofubi with parts from the Heathen Snake Skelve. The Heathen Snake looks to be a tad different from its smaller cousin in the Wandering Misfits series. 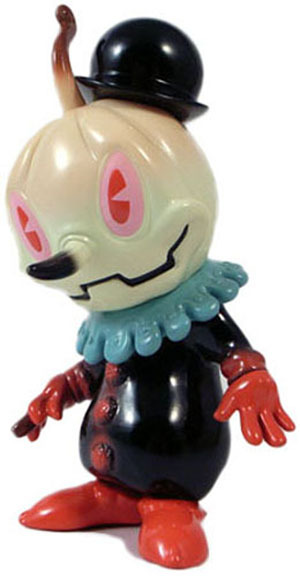 This is great because it gives the sofubi version a whole new persona. 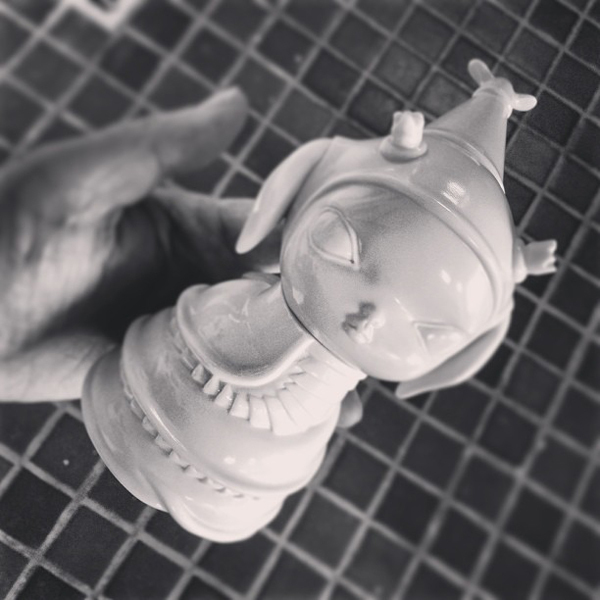 The sofubi Heathen is modular just like Stingy Jack and Calliope so you can interchange the head and body. Our dynamic duo is truly loving the ability to swap out parts to create new sofubi! 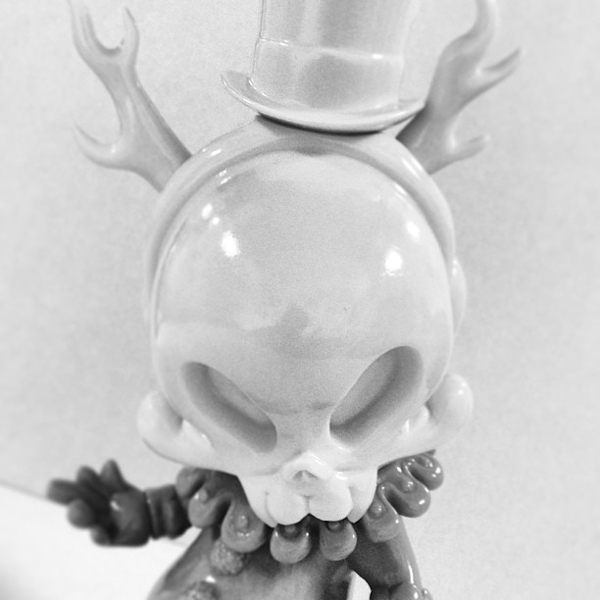 Even though these are just early prototypes, the snake head really stands out for all of us with antlers, a top hat – and those eyes! The final version is going to be amazing to review and see! From time to time, the Circus Posterus Instagram feed will sneak in some gems if you pay attention. Right before the weekend was one of those times! What appears to be something very obvious, actually. 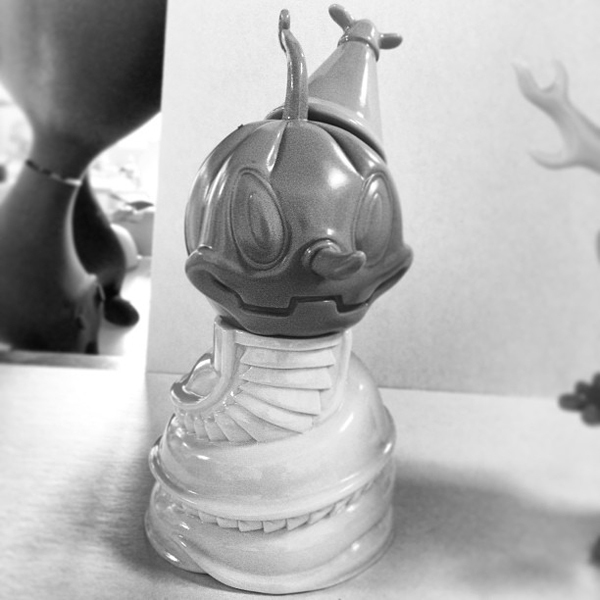 It looks like a Heathen Snake Skelve sofubi is coming from Tomenosuke + Circus Posterus! This coiled cold-blooded skelve will make many fans happy when it debuts. Speaking of, Monsters & Misfits III is in September, could this be the release day?